What changes make the 2017 Toyota Corolla and Corolla iM different? Revised styling, fresh features, new model names, and adoption of a hatchback body style orphaned by the shutdown of Toyota’s youth-oriented Scion division. Addition of autonomous emergency braking to mitigate or avoid a frontal collision as a standard feature on all versions of the ’17 Corolla is a major advancement. On many competitors, this important driver assist costs extra, is limited to the top models, or is unavailable altogether. Joining the compact-class Corolla sedan, the subcompact-segment hatchback isn’t an all-new vehicle, but rather a re-skin of the Scion iM, rebadged the Corolla iM. It’ll compete with such cars as the Kia Soul, Nissan Versa, and Hyundai Accent (nos. 1-3 in segment sales). 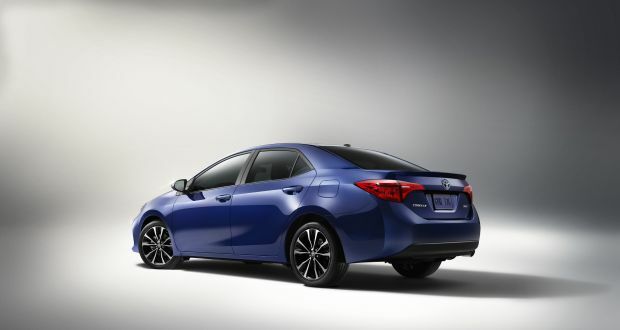 The iM will likely account for less than 10 percent of Corolla-nameplate sales. The Corolla sedan is the second-best-selling compact car in the U.S. behind the Honda Civic, and ahead of the Nissan Sentra, Ford Focus, and Hyundai Elantra. As with virtually every car category, though, overall compact-segment sales are down, in this case, more than 8 percent through the first eight months of 2016. Of note, model-year 2017 is the 50th anniversary of the Corolla nameplate, making it one of the longest running and most successful in the auto industry. These small cars first went on sale in Japan in 1966. Exports to the United States started two years later. Over the years, Toyota has sold more than 43 million Corollas worldwide in numerous forms, including hatchbacks and wagons. For more than two decades, the only Corolla available in the U.S. has been a four-door sedan, and it will continue to be the most popular choice by far. Because you want affordable and reliable — if unexciting — basic transportation that has slightly more aggressive styling and significantly more safety features than the 2016 Corolla. Sedans return in base L, volume LE, and fuel-economy-minded LE Eco trim levels. Gone for ‘17 are the LE Plus, LE Premium, S, S Plus, and S Premium trim levels, added are the upscale XLE and sport-themed SE and XSE models. Toyota is also producing a 50th Anniversary Special Edition version of the SE sedan. These cars have unique paint and trim. The production run is limited to 8,000 units. Hatchbacks will come in a single trim level. Should I wait for the 2018 models instead? No. With the Corolla sedan freshened for model-year 2017, and the iM new to the U.S. for 2016, there will be few if any changes worth waiting for. Fully redesigned versions of both the sedan and hatchback are due sometime in calendar 2018 as 2019 models. Production of the next-generation Corolla sedan and Corolla iM will shift to a new facility in Mexico from their current homes of Canada and Japan, respectively. For the sedan, yes; for the hatchback, no. The biggest change for the sedan is at the front end, which adopts a similar look to Toyota’s Prius hybrid and RAV4 compact crossover. It’s more aggressive, with a grille that stands out more than the 2016. XSE models get specific trim and wheels that mirror those on the larger Camry sedan. All sedans continue with LED headlamps as standard, an extremely rare feature in this price strata. For ’17, L, LE and LE Eco grades gain bi-LED headlamps with LED high-beam elements. The LED headlamps on SE, XSE and XLE combine high- and low-beam functions. Redesigned 16-inch wheels are standard on the LE and XLE, while the SE and XSE step up to standard 17-inch alloys. 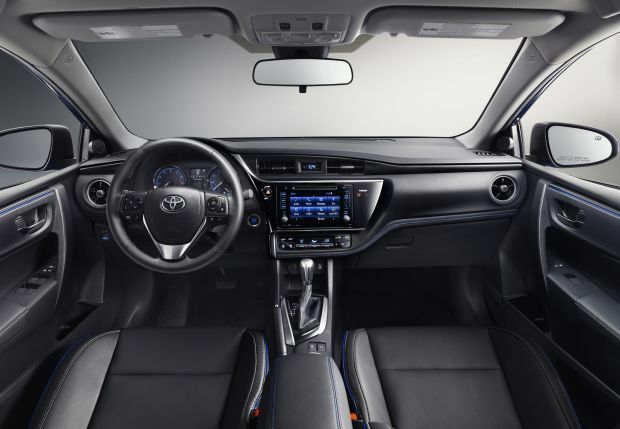 Corolla’s interior design is unchanged. The sedan and hatchback are pretty much average for the class in terms of passenger and cargo room. We prefer the latter for its extra versatility. Both body styles have fairly intuitive climate and audio controls. Sedans use Toyota’s corporate Entune infotainment system, while hatchbacks use a third-party setup. Both have similar functions, including Bluetooth and support for built-in apps when a supported smartphone is connected. Neither Apple CarPlay nor Google Android Auto is available, however. No. All sedan and iM models are front-wheel drive and have a four-cylinder engine of 1.8-liters. The engine has design differences tailored to each application. Interestingly, the high-mileage Corolla LE Eco has more power than the other Corolla sedans: 140 horsepower and 126 pound-feet of torque versus 132 and 128, respectively. The iM’s version of the engine makes 137 horsepower and 126 pound feet of torque. A 6-speed manual transmission is standard in the SE sedan and in the iM. A continuously variable transmission (CVT) that performs the duties of a conventional automatic is a $740 option on those models and standard otherwise. More than 90 percent of buyers will choose the CVT, but kudos to Toyota for continuing to offer the manual, which is surprisingly easy to drive, with smooth shift and clutch action. Unfortunately, the stickshift is the about the only highlight of the driving experience. The engine drones loudly in all models, especially with the CVT, as its programming allows engine speed to race ahead of road speed. There’s copious road and bump noise, too. Corolla’s handling is forgettable. It won’t let you get into trouble, but there’s absolutely zero excitement to be had. The steering lacks the razor-sharp precision of a Honda Civic, and there’s far more body lean in turns than in the Mazda 3. Corolla won’t be liable to leave you stranded in the snow, however. All told, raw performance isn’t this car’s primary mission, but it would be nice for Toyota to inject some personality into how this car drives. No. Corolla ranks about mid-pack for fuel economy among compact cars. According to the EPA, with the manual transmission, the sedan rates 28/37/31 mpg city/highway/combined while the hatchback gets 27/35/30. CVT-equipped sedans, save for the LE Eco, get ratings of 29/38/32 mpg with their standard 16-inch tires and 29/37/32 with the optional 17s. The LE Eco employs various mechanical and aerodynamic tricks designed to enhance fuel economy. They come standard with 15-inch tires and models so equipped get an EPA rating of 30/42/35 mpg. Their optional 16s drop those numbers to 30/40/34. All hatchbacks with the CVT rate 28/36/31 mpg. Yes, foremost being addition of Toyota Safety Sense-P (TSS-P) for the sedans and Toyota Safety Sense-C (TSS-C) for the iM. TSS-P is the more complete system and includes lane-departure warning with automatic steering correction to keep you in your lane; adaptive cruise control to maintain a set distance from traffic ahead; and automatic high-beam headlight control. It also can sense an impending frontal collision with another vehicle or a pedestrian and apply the brakes, even autonomously stop the car, to prevent contact. Presence of that last feature qualifies the ’17 Corolla sedan for coveted Top Safety Pick+ status from the Insurance Institute for Highway Safety (IIHS). The slightly less-comprehensive TSS-C system newly standard in the iM includes lane-departure warning with no steering correction, and automatic high-beam headlights. It has autonomous emergency braking, but without pedestrian detection. A rearview camera becomes standard across the Corolla line. In terms of convenience features, sedans equipped with the optional in-dash navigation system get a new 7-inch dashboard touchscreen, up from the previous models’ 6.1-inch unit. XSE and XLE models get leatherette upholstery with heated front seats. The 50th Anniversary Edition has a standard power sunroof and keyless entry with pushbutton engine start, along with unique interior trim. Yes, about 1.5 percent higher on average, depending on trim level. This translates to increases of around $290, which isn’t bad considering the safety equipment that’s now standard. For comparison, the Honda Sensing safety suite, which includes most of TSS-P’s features, is a $1,000 option on the Civic. Base prices in this review include Toyota’s $865 destination fee. Sedans start at $19,365 for the base L model. The volume-leading LE starts at $19,800 and the LE Eco at $20,200. SE versions list for $22,530. The XSE starts at $23,545. Our pick would be the iM. It’s more enjoyable to drive than the sedan while being a solid value for the money. It starts at $19,615 with the manual transmission and $20,355 with the automatic. The L sedan has no factory options aside from a few different paint colors. 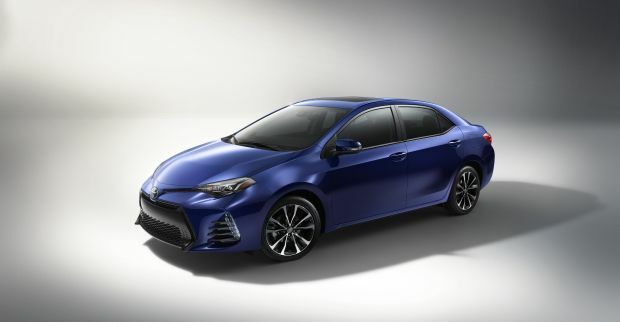 The LE will make up the bulk of Corolla sales, and we expect most retail buyers to pony up for the $1,215 Premium Package, which adds a smartphone-based navigation system (in lieu of Apple CarPlay or Google Android Auto); an upgraded audio system; and aluminum wheels. Buyers can add a power sunroof to this package, which brings its total cost to $1,665. SE models with the CVT have a Premium Package as well. For $1,535, you get the same features as the LE Premium Package with Sunroof plus pushbutton ignition. The sunroof is a $850 standalone option on the 50th Anniversary model. The only factory option of note for the XSE and XLE is an in-dash navigation system that doesn’t rely on a separate smartphone app to operate. It costs a very reasonable $525. As a holdover from its Scion days, the Corolla iM’s options list consists solely of dealer-installed accessories. Of note is an upgrade to the audio system head unit that includes a built-in navigation system. It will set you back $900. Release date for the 2017 Toyota Corolla iM is early September 2016 and release date for the ’17 Corolla sedans is a couple weeks thereafter. The iM is one of three former Scion models migrating to the Toyota brand as the automaker shutters its youth-oriented division. The Mazda-built subcompact iA sedan becomes the Toyota Yaris iA. The Subaru-built, rear-wheel-drive Scion FR-S coupe will be the Toyota 86 (an homage to the Corolla AE86, a popular car on the drifting scene). The front-wheel-drive Scion tC hatchback is discontinued. Honda Civic, but only in terms of high-tech safety features as standard, rather than optional; Nissan Sentra, which is roomy but underpowered and unrefined; and Mitsubishi Lancer, an admittedly low hurdle, considering that this poor-selling compact car hasn’t fundamentally changed since model-year 2008. Honda Civic, the overall class leader for its balance of roominess, reliability, resale value, and road manners – enhanced by the model-year ’17 addition of a four-door hatchback body; Mazda 3, with sedans and hatchbacks that set the pace for styling and handling, though not for passenger space; and Hyundai Elantra, arguably the most refined entry in the competitive set and backed by top-notch warranty coverage. A more refined drivetrain and more kick to the handling. A performance model to rival the upcoming Honda Civic Si and Hyundai Elantra Sport would be nice, too.